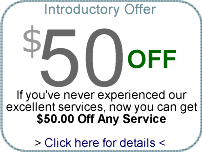 The reason we can make such an offer is because we believe in our service. Our equipment is unique, and our processes are unsurpassable. Additionally, we select only the type of personnel you yourself would invite into your home or business, and train them to be experts in their field. so relax; we gladly accept responsibility for your furnishings when we are your guest.